Meet your guide at a central location in Malaga, Torremolinos, Fuengirola, or Marbella at the specified morning departure time between 7:45 a.m. and 10 a.m. With your guide and your group, tour Marbella’s Golden Mile, a four-mile stretch along the western edge of Marbella city scattered with luxurious villas and coastal views. Your guide will provide informative commentary and help you spot popular attractions. Upon arrival at the Puerto Banus marina at the opposite end of the Golden Mile, enjoy free time to stroll around and enjoy the sites — you may even spot one of the many celebrities who frequent this famously luxurious hangout. 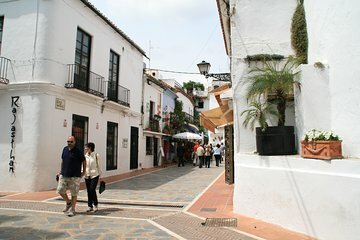 Then, continue to the street market in Nueva Andalucia and enjoy free time here to shop, dine, and stroll between the stalls of this popular venue, offering everything from fine art to funky antiques. At 2 p.m., board the coach and return to your hotel.